Dogs may keep their title as Man’s Best Friend, Horses don’t care for that. Horses, and especially the most expensive horse breeds, are royalty. They look majestic, and beautiful and can make you soar through valleys on their backs. Of course, such majesty always comes with a hefty price tag, and Horses are certainly quite high up there amongst animal species. This is obvious because the cost of bringing them up, training them, etc, is also phenomenally high. You can live with an untrained cute dog, and the most you’ll have to worry about is a little brown surprise on your rugs. But it’s impossible to keep an untrained horse around. So here’s a list of some of the most expensive horse breeds in the world out there. These are best given as gifts to teenagers who are just stepping into the Equestrian world and would like a taste of their first riding glory. They’re adorable and look somewhat like a little boy or girl with an unkempt mane of hair. They rise up to a maximum of 4 feet in height and that is perfect for training young riders before they can advance to the more mighty steeds. While they generally come in a combination of two shades, they come in a lot of combinations such as the piebald, bay chestnut, the sun, silver dapple, just to name a few. Clydesdale is actually a place in Scotland, and this is where these horses are mostly found, thus earning them their name. With a height range of 64 to 72 inches and a weight of 800 to 900 kilograms, these are quite large in size and build. They are great for agricultural purposes as they come with strong muscles and the ability to carry heavy loads. They are also really energetic and farmers could make use of them to plough their fields through most of the day. Some of their most prominent shades are chestnut, black and gray. They even have markings on their face and legs. They are currently mostly available in Australia, though during the earlier centuries they were carried all around the world due to the utility. These are spotted and dappled racing horses. They’re immensely popular in the US and is currently the state horse of Idaho. Due to their unique and interesting look, they’re often used in Hollywood movies. Some of the show events that they often participate in are hunting, show jumping, dressage, amongst many others. They are about 58 to 63 inches high and 450 to 550 kilogram heavy. This is the ideal weight and height for them to be really fast and excel in sports. Often called Wild Horses, these are imported from Spanish to the rest of the world, and earn their name because of their famed nature which can’t be tamed, at least not so easily. However, they are closer to the verge of extinction than any other horse breeds. As a reason, the US adopted a law in 2015 to start conserving them and protecting their kind. Their height ranges from 55 to 60 inches. They used to be utility horses meant for the nobility in previous centuries, as they are ideal for long distance riding, due to their speed and stability. 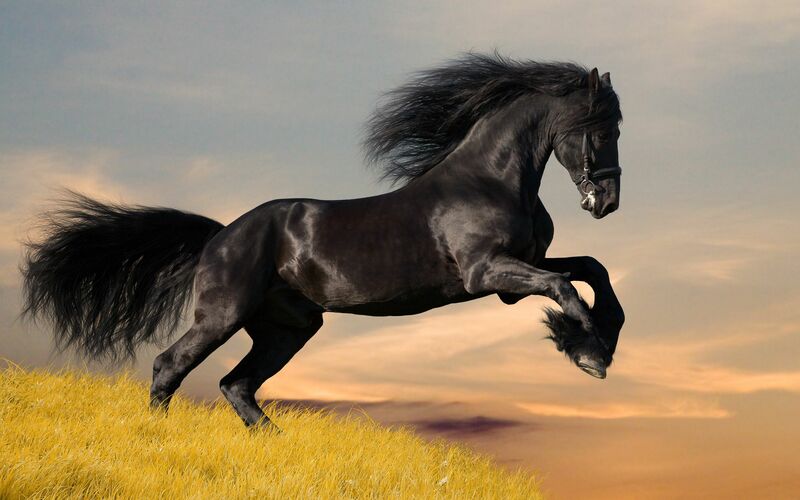 They can outrun most other horses at the speed of 88.5 km/h, with a 58 to 63-inch high body. They are often used at tourist spots to offer carriage rides through beautiful streets, they can also be found in beaches often. These are otherwise racing horses and have smooth muscles. Their prominent colors are the red road, gray, black and brown. They are extremely high in demand, and great for tourist spots, and that utility coupled with beauty fetches it a high price tag. They originated in the US in 1945, and derive their name from the distinct paint blot patterns on their body, a distinct and random mix of chestnut brown and white. Some of the color patterns on these horses are named Tobiano, Sabino, Tovero, amongst others. They are also quite dauntless and are used in bullfighting rings to drive off the bulls. This fearlessness also makes them a great hunting horse. They derive their name from their place of origin, that is, Friesland in the Netherlands. Friesian were popularly used as War Horses back in war-torn Europe of the middle ages. They were a favorite amongst many kings of the past. This breed is available primarily in black and is distinctive for its thick mane and head of hair. They are generally 60-68 inches tall. They’re also one of the most utilized breeds in almost all Period Dramas. They were often used as Cavalry Horses in the American Civil War, and they’ve been used in battlefields quite often even as recently as the First World War. However, currently, they are used mostly for racing purposes. They come in chestnut brown, bay and black, and their height ranges from 55 to 65 inches. Another popular racing horse. To be fair though it is fairly obvious that most expensive horse breeds now would derive their value from their ability to race because racing and sporting events are some of the only uses left for them, since we’ve advanced from driving horses to driving Ubers in our daily lives. They are around 62-68 inches tall. The thoroughbred is mostly famous for their speed, agility, spirit, and perseverance and hence considered as “hot-blooded”. Theses characteristics prove them helpful and advantageous in the longer races. One of the reasons they’re worth so much is that they are solely bred in the Arabian Peninsula. They’re a versatile breed and often dominates the discipline of endurance riding and much other equestrian sport. Their height ranges from 55 to 60 inches, and they have a distinct structure which is tall and lean with strong muscles. They’re one of the oldest horse breeds going as far back as 4500 years and are also among the top 10 popular horse breeds in the world. 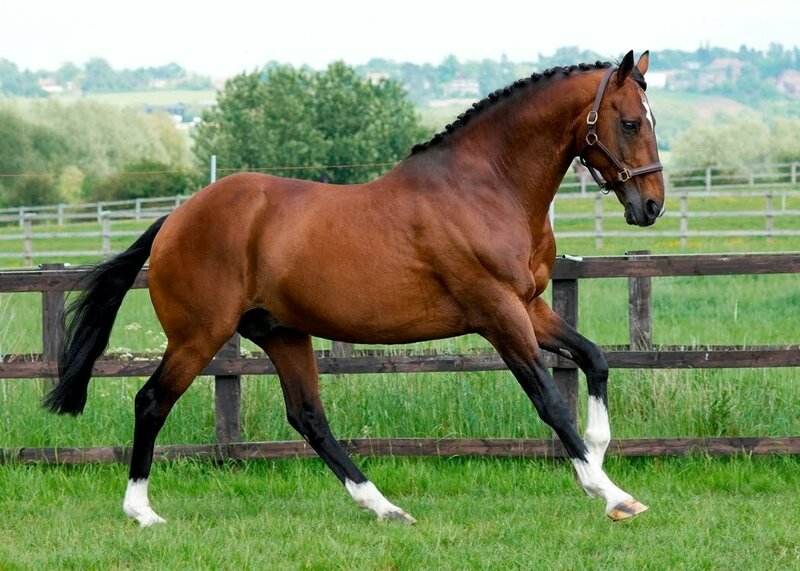 So these are some of the most expensive horse breeds out there. Let us know which one of these most expensive horse breeds most gets your heart palpitating, and whether you’d like to adopt one of them, or would you rather stick to your dogs. Let us know your thoughts in the comments down below, we’d love to hear from you!